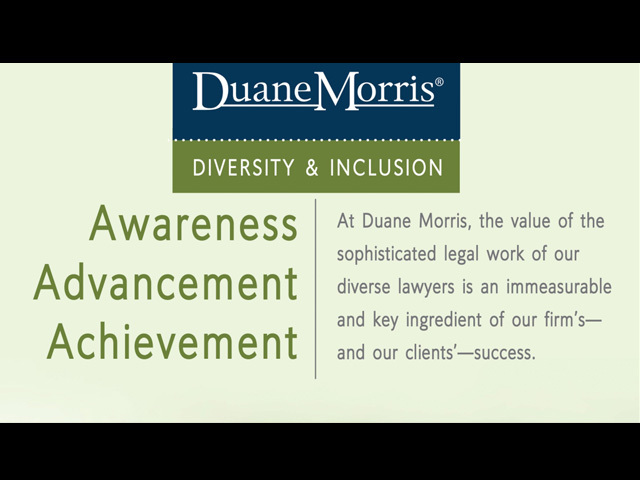 Duane Morris manages its diversity and inclusion program with the objective of utilizing the best talent worldwide in solving legal problems. The firm recruits a diverse pool of lawyers that collectively possess an awareness of cutting-edge 21st century issues—legal, social and economic—for which clients require solutions. Because diversity management is integral to the core business of our management and each of our practice groups, our programs for the recruitment, retention and promotion of historically minority groups will continue and grow. The firm's attorneys and its leadership believe in accentuating the added value that diverse attorneys possess and generating profitable new business opportunities from this added value. To learn more, please contact Joseph K. West, Duane Morris’ Chief Diversity and Inclusion Officer. In conjunction with the retreat, Duane Morris holds its annual George B. Vashon Lecture. In 2018, the firm presented the panel discussion, " From Lean In to Time’s Up – The Corporate and Legal Landscape for Women." With introductory remarks by Duane Morris Chairman and CEO Matthew A. Taylor, the keynote speech by Stephanie Scharf, Chair of the ABA Commission on Women in the Profession and Joseph K. West serving as moderator, the panel featured Deborah DeHaas, Vice Chairman and National Managing Partner, Deloitte; Sandra A. Jeskie, Partner and Women’s Impact Network for Success (WINS) Chair, Duane Morris LLP; Deborah Elam, Retired Chief Diversity Officer and President of the GE Foundation, General Electric Company; and Stephanie Scharf. The 2017 retreat was held on May 6 and featured the theme of “Diversity and Inclusion: New Approaches for a New Era.” Mark Roellig, Chief Technology and Administrative Officer at Massachusetts Mutual Life Insurance Company, gave the keynote speech on “The Value of Inclusion: Client Expectations, Firm Responsibilities.” For the 2017 George Vashon Lecture, the firm presented the panel discussion, "Diversity and Inclusion in the Judiciary – A View From the Bench." With introductory remarks by Cyndie M. Chang and Joseph K. West serving as moderator, the panel featured Judge Theodore McKee, U.S. Court of Appeals for the Third Circuit, Judge Luis Felipe Restrepo, U.S. Court of Appeals for the Third Circuit, Chief Judge Solomon Oliver, Jr., U.S. District Court for the Northern District of Ohio and Judge Nannette Jolivette Brown, U.S. District Court for the Eastern District of Louisiana. The 2016 retreat was held on May 21 and featured the theme of “Linking Success to Organizational Culture.” Aracely Muñoz Petrich, Vice President of Development at the Minority Corporate Counsel Association, led Interactive Implicit Bias Training and Donald M. Remy, Executive Vice President of Law, Policy Governance, Chief Legal Officer at the NCAA, spoke on the “Intersection of Diversity, Culture, Entertainment and Sports.” George B. Vashon Guest Lecturer was David B. Wilkins, Lester Kissel Professor of Law, Vice Dean for Global Initiatives on the Legal Profession, Faculty Director, Center on the Legal Profession, at Harvard Law School. He spoke on the topic “Why Are There (Still) So Few Black Lawyers in Corporate Law Firms? A 20-Year Retrospective and Some Thoughts About the Future,” which was followed with a lively panel discussion moderated by Joseph K. West, Partner and Chief Diversity & Inclusion Officer at Duane Morris. In 2015, the Diversity & Inclusion Retreat featured Fred Maahs, Senior Director of Community Investment, National Partnerships at Comcast, Vice President, Comcast Foundation, and former chair of the American Association of People with Disabilities, who spoke on the 25th Anniversary of the Americans with Disabilities Act and related current legal and social issues. In 2015, our guest lecturer for the Vashon Lecture was Dean Wendell Pritchett, Interim Dean and Presidential Professor, University of Pennsylvania Law School Donna Cooper, Executive Director, Public Citizens for Children and Youth (PCCY), moderated the discussion “What Do We Mean When We Say Education Is a Civil Right?” with panelist Judge Wendy Beetlestone, Federal Judge, U.S. District Court for the Eastern District of Pennsylvania, Anthony Hardy Williams, State Senator, Pennsylvania and Lisa Scruggs, Partner, Duane Morris LLP. In 2014, our guest lecturer was The Honorable Theodore A. McKee, Chief Judge, United States Court of Appeals for the Third Circuit. Renée Cardwell Hughes, CEO, American Red Cross Southeastern Pennsylvania Chapter, moderated a panel that included Robert W. Bogle, President and Chief Executive Officer, The Philadelphia Tribune, Zane D. Memeger, U.S. Attorney for the Eastern District of Pennsylvania and Eric R. Breslin, Partner, Duane Morris. In 2013, our retreat guest lecturer was Debo P. Adegbile, Special Counsel, NAACP Legal Defense and Educational Fund, Inc. Dean and Bernard G. Segal Professor of Law Michael A. Fitts, University of Pennsylvania Law School, moderated a panel that included Harold Jackson, Editorial Page Editor of The Philadelphia Inquirer, and Jennifer R. Clarke, Executive Director of Public Interest Law Center of Philadelphia. Nationally known consultants Dr. Arin N. Reeves and Kathleen B. Nalty also engaged the group on enhancing firm culture through diversity and inclusion. In 2012, retreat guest speakers included Joseph K. West, President and CEO, Minority Corporate Counsel Association and Kenneth Gamble, Chairman, Universal Companies; Chairman, Philadelphia International Records; and Co-Founder of TSOP (The Sound of Philadelphia). The Vashon topic in 2012 was "The Law & Politics of Affirmative Action." Randall L. Kennedy, the Raymond Pace and Sadie T.M. Alexander Visiting University of Pennsylvania Professor of Law in Civil Rights, the Michael R. Klein Professor of Law at Harvard, and award-winning author, was the guest lecturer. In addition, Duane Morris invited a panel moderated by David L. Cohen, Executive Vice President at Comcast Corporation, to comment on the positions taken by Professor Kennedy. The panelists included Joanne Epps, Dean and Professor of Law, Temple University Beasley School of Law; Sharmain Matlock-Turner, President and CEO, Urban Affairs Coalition; and Thomas Servodidio, Duane Morris partner and chair of the Employment, Labor, Benefits and Immigration Practice Group. In 2011, guest speakers included Don H. Liu, Corp. Senior Vice President, General Counsel and Secretary, Xerox Corporation; Daniel R. Biddle and Murray Dubin, authors of Tasting Freedom; and Tommy M. Shi, Esq., Diversity and Inclusion Officer, Mercedes-Benz USA, LLC. In 2010, guest speakers included Mayda Prego, Senior Counsel, Chevron Corporation's Global Downstream/Latin America & Caribbean Regional Unit, and Norma Romero-Mitchell, President of Benefits Plus Consulting Group, Inc. In 2009, our diverse attorneys and diversity and inclusion committee members attended a dinner at Philadelphia City Hall, featuring speaker Philadelphia Mayor Michael Nutter. In 2008, our guest speaker was Wendy Shiba, Executive Vice President, General Counsel & Corporate Secretary of KB Home. In 2007, our guest speaker was Douglas Gaston, Senior Vice President and General Counsel of Comcast Cable. Every year on Spirit Day, Duane Morris turns its website purple to support LGBT youth and the Gay & Lesbian Alliance Against Defamation's (GLAAD) anti-bullying campaign. The Daily Report's ATLaw blog recognized that Duane Morris led the way among law firms in this consciousness-raising effort, being the only firm listed as a participant as far back as 2012. Since then, other law firms have joined Duane Morris and the many well-known companies who pledge to go purple each October. Duane Morris attorneys are active in organizations that support LGBT inclusion, from the workplace to the broader community. Attorneys at Duane Morris have taken an active role in LGBT networking groups and law associations, including the National LGBT Bar Association as well as local organizations, and have written on topics including transgender workplace law. On May 8, 2018, the Chicago Inclusion Committee hosted a lunch presentation by Abdul Misbah, an Afghan attorney who has been recognized for his social advocacy and contributions to the rule of law in Afghanistan by the U.S. State Department, the U.S. Defense Department, numerous Afghan Government agencies, the United Nations Refugee Agency, the Norwegian Refugee Agency and the International Development Law Organization. Mr. Misbah, who worked with the U.S. military and diplomatic offices prosecuting Taliban and other insurgent fighters, provided an overview of the cultural and religious issues that arose while working with U.S. and Afghan attorneys, and how he managed those issues. Mr. Misbah also told the story of his own legal carrier, which began in 2004 after he graduated from Kabul University, where he later served as the Dean of the Law Faculty. Early in his legal career, Mr. Misbah advocated for children, gender equality, and protections for indigent people in rural Afghan communities. From 2010 to 2015, Mr. Misbah assisted the U.S. Defense and State Departments in Afghanistan, serving as the lead Afghan legal consultant to an international team of lawyers in the Prosecution Department of the Justice Center in Parwan. During that time, he also worked with former Duane Morris partner John Maher. In 2015, to protect his family’s safety after receiving death threats, Mr. Misbah moved to Chicago. He has since reconnected with John Maher and together they formed Misbah Maher Consultancy LLC. Please visit the Duane Morris LLP Facebook page to view photos from this event. The Los Angeles Business Journal recognized Duane Morris Los Angeles Managing Partner Cyndie Chang as one of the 50 Most Influential Minority Attorneys, citing her extensive litigation experience and leadership within the firm and in the legal community. On September 26, 2017, Samuel Harris, a Holocaust survivor and a founder and President Emeritus of the Illinois Holocaust Museum & Education Center, shared his remarkable story with the Chicago office at a special Inclusion Committee presentation. With poignancy and even humor, Sam recounted his memories as one of the youngest survivors of the Holocaust. Born in Deblin, Poland, in 1935, Sam was just four years old when the war came to his town. Having lost his parents and most of his family during the Holocaust, Sam survived by hiding, from the ages of seven to nine-and-a-half, in the Deblin and Czestochowa concentration camps. Although an orphan when he arrived in the USA at the age of twelve, Sam was filled with hope about the possibilities awaiting him. Through the Jewish Children's Bureau in Chicago, Sam was adopted by Dr. Ellis and Mrs. Harriet Harris of Northbrook. He went to New Trier High School and was diligent in his studies and intense in athletic competition. College and a career, marriage and fatherhood followed, but in 1981, he reconnected with his past at the World Gathering of Jewish Holocaust Survivors in Jerusalem. Today, he speaks to thousands of children and adults annually. Sam was an instrumental force behind the building of the 65,000 square-foot Illinois Holocaust Museum & Education Center. In 2014, Sam was the proud recipient of the Ellis Island Medal of Honor. In August 2017, John A. Nixon was honored with a Leadership Excellence Award from the Pennsylvania Diversity Council at the 8th Annual Philadelphia Diversity and Leadership Conference (PADC). The award is presented to individuals who exhibit leadership excellence in their organizations and communities. Winners are chosen for professional leadership skills, effective and efficient management, innovation and vision. Created in 2010, PADC aims to foster a learning environment for organizations to grow and leverage their knowledge of diversity. With councils in Pittsburgh and Philadelphia, PADC provides opportunities for organizations, professionals and students to learn diversity best practices from corporate leaders. Mr. Nixon, a partner in the Philadelphia office practices in the area of employee benefits and executive compensation. He is a frequent lecturer, commentator and author on executive compensation and employee benefits issues. In August 2017, Equality Illinois recognized Duane Morris as a Top Law Firm in recruiting, hiring and retaining LGBTQ lawyers and employees in its annual “Raising the Bar” survey on LGBTQ inclusivity. Ms. Chang was also recently honored by the Asian Pacific American Women Lawyers Association (APAWLA) for being the first female managing partner of a major Los Angeles area firm. APAWLA is an organization that promotes inclusion, empowerment and advancement of Asian Pacific American women in the legal profession. Ms. Chang is the managing partner of the firm's Los Angeles office and litigates complex business and commercial disputes involving contracts, unfair competition, trademark, trade secrets, products liability, the Americans with Disabilities Act (ADA), broker disputes, entertainment and real estate law. In October 2016, Denyse Sabagh received the second annual Duane Morris Pro Bono Leadership Award for her pro bono aid to many low-income immigrants throughout her career, including refugees, asylees, citizenship applicants, domestic violence survivors, children and many more. In addition to serving on the firm’s Pro Bono Committee since its inception, Ms. Sabagh, who serves as chair of Duane Morris’ Immigration Practice Group, has led the American Immigration Lawyers Association’s (AILA) pro bono efforts for decades. She has averaged more than 100 pro bono hours annually since the firm began collecting data on pro bono service and has mentored and encouraged many Duane Morris attorneys in their service. Ms. Sabagh, a partner in the Washington, D.C. office, represents individual and corporate clients for all of their immigration needs and also represents clients in I-9 audits, complex immigration cases, consular processing and immigration ramifications of criminal charges. In addition, she represents family-based clients. In October 2016, Manita Rawat was honored by the National Asian Pacific American Bar Association (NAPABA) with its “Best Under 40” award. NAPABA recognizes individuals within the Asian Pacific American legal community under the age of 40 who have achieved prominence and distinction in their fields of endeavor—be it the practice of law, academia, business, civic and charitable affairs, the judiciary or politics—and who have demonstrated a strong commitment to Asian Pacific American civic or community affairs. Manita Rawat, a partner in the Silicon Valley office, practices primarily in the area of intellectual property law and litigation. In September 2016, Terrance J. Evans was named to the Minority Corporate Counsel Association (MCCA) N-Gen (Next Generation) advisory board, a select group of 13 in-house and law firm attorneys throughout the country who assist the MCCA in its efforts to promote diversity and inclusion in the legal profession. Next Generation board members are chosen by the MCCA based on experience and recognized leadership in the law. Evans serves as co-chair of the Duane Morris San Francisco Diversity and Inclusion Committee and is the West Coast Vice Chair of the firm’s Banking Practice Group. Evans was also selected as an LCLD Fellow for the 2012 Fellows Program of the Leadership Council on Legal Diversity (LCLD), a national organization made up of the legal profession's top general counsels and managing partners. Duane Morris LLP is pleased to announce that the United States-Mexico Chamber of Commerce (USMCOC) has honored Singapore-based partner Eduardo Ramos-Gómez with its prestigious Buen Vecino Award. The award recognizes public- and private-sector leaders for their vision and commitment to mutually beneficial relations between Mexico and the United States. Ramos-Gómez accepted the award at the chamber's Binational Conference and Buen Vecino Awards Gala, held on October 28–29 in Mexico City. Duane Morris LLP has appointed Cyndie M. Chang managing partner of its Los Angeles office. Chang succeeds partner Russell W. Roten, who served in that role since the launch of the office in 2006. The firm's Los Angeles office serves clients throughout Southern California, as well as throughout the United States and internationally. Chang has been elected to the National Asian Pacific American Bar Association (NAPABA) Board of Governors for the 2013-2014 board year, was named "Lawyer on the Fast Track" by The Recorder in 2013, and was accepted to join the ABA's Tort Trial & Insurance Practice Section (TIPS) Leadership Academy for the 2010-2011 bar year. Chang also presented at the National Asian Pacific American Bar Association (NAPABA) Annual Convention: Sustainability 2011: Renewal and Growth for Today and Tomorrow in Atlanta, Georgia and co-sponsored the LGBT Champagne Reception at the HNBA Annual Convention in Dallas. Lisa T. Scruggs has joined the firm's Trial Practice Group as a partner in its Chicago office. Scruggs bolsters Duane Morris' strengths in serving the education industry, bringing to the firm extensive litigation and counseling skills. Scruggs joins the firm from Jenner & Block LLP. Scruggs, founder and leader of her former firm's Education Industry team, provides counsel and representation to education reform organizations; charter school organizations, networks and individual schools; school districts; and private schools. Her practice has included handling issues regarding new school development, teacher quality reform, virtual education, public/private education ventures and student and parent rights. Jennifer A. Kearns, a partner in the firm's San Diego office, has been re-elected to the board of directors of Mama's Kitchen, Inc. Mama's Kitchen is a nonprofit organization that delivers full nutrition to low income clients affected by AIDS/HIV or cancer at no cost to the client. Full nutrition means three meals a day for every day of the year. If a client has minor children living in the household, Mama's Kitchen also delivers full nutrition to the children, also at no cost. Founded in 1990, Mama's Kitchen delivered its six millionth meal in 2012. Kearns served two consecutive terms as a member of the board of directors of Mama's Kitchen from 2004 through 2010 and served as board president in 2007. Her new term will commence January 1, 2014. Kearns was also honored by the Tom Homann LGBT Law Association with its annual Friend of the Community Award. The award is presented to people who have made a positive impact in San Diego and the lesbian, gay, bisexual and transgender (LGBT) community in particular. Duane Morris has been cited as one of five law firms on the 2012 Honor Roll of Legal Organizations Welcoming Women Professionals. Created by the Pennsylvania Bar Association (PBA) Commission on Women in the Profession (WIP), the annual list recognizes law firms that are committed to diversity and provide tools to enable women lawyers to continue and advance in their professional careers. They include flexible work schedules, backup childcare, networking events and other innovative programs. This is the third year in a row that Duane Morris has been named to the Honor Roll. Duane Morris is the 2012 recipient of the George B. Vashon Innovator Award presented by the Minority Corporate Counsel Association (MCCA) for innovative best practices by a law firm in Recruitment and Retention. 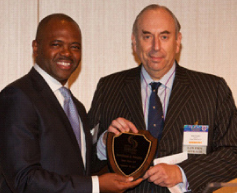 John J. Soroko, Chairman of Duane Morris, accepted the award at the Diversity Innovators Awards Reception following the Pathways Conference on September 10, 2012 in New York City. The Innovator Award, which now carries the George B. Vashon name, has special significance to Duane Morris. Vashon was former Duane Morris Chief Diversity Officer Nolan N. Atkinson, Jr.'s great-grandfather. Atkinson and others petitioned the Pennsylvania Supreme Court to grant Vashon posthumous admission to practice law in the Commonwealth of Pennsylvania. The noted abolitionist and activist had been denied admission to practice law in Allegheny County (Pittsburgh) because of his race. Joseph K. West, President & CEO of MCCA, said that the Award carries Vashon's name because of his "steadfast determination in the face of discrimination and his accomplishments following rejection of admission to the bar in Pennsylvania." Vashon became the first African-American admitted to the bar in New York State in 1847. Arfat Selvam, managing partner of Duane Morris' Singapore office, was shortlisted for "Managing Partner of the Year" award in the ALB Southeast Asia Law Awards 2012. Ms. Selvam has over forty years' experience in corporate finance having been at the forefront of the development of the financial services market in Singapore. Her wide array of experience includes mergers and acquisitions, corporate restructures, takeovers, funds raising in the capital markets, privatisations, financial services, cross border investments, financial services and international joint ventures. Duane Morris was a co-sponsor for the LGBT Champagne Reception at the HNBA Annual Convention in Dallas this year. The reception was very well attended. Also during the HNBA Convention, Duane Morris partner Mauro M. Wolfe participated in a panel discussion on the topic of "Corporate Compliance and Business Ethics Programs." Denyse Sabagh, head of the firm's Immigration Practice Group, was honored with the American-Arab Anti-Discrimination Committee (ADC)'s Hala Salam Maksoud Leadership Award. Named after former ADC president and nationally recognized civil and human rights advocate Dr. Hala Salam Maksoud, the award is presented annually to a community leader who has exhibited great leadership, strength and compassion toward the concerns of the community and the mission of ADC. Denyse was previously named as one of the 30 "Stars of the Bar" in Washingtonian magazine's listing of the "top guns of the profession" in Washington, D.C. The magazine said, "Sabagh's peers describe her as the immigration lawyer who can do it all." Duane Morris partners Robert L. Archie, Jr. and Nolan N. Atkinson, Jr., the firm's Chief Diversity Officer, were named to The Legal Intelligencer's 2011 Diverse Attorneys of the Year for their outstanding professional achievements. Letters of recommendation for the recognition were solicited from bar associations, law firms, public interest groups, corporations and government offices. George B. Vashon, Atkinson's great-grandfather, who was posthumously admitted to the Pennsylvania Bar in 2010, was also listed. Atkinson played a major role in petitioning the Pennsylvania Supreme Court on behalf of the family of George B. Vashon, Atkinson's great-grandfather, to posthumously admit Vashon to practice law in the Commonwealth of Pennsylvania. Vashon sought admission to practice law in Allegheny County in 1847 and 1868, but was rejected in both cases because of his race. In The Philadelphia Tribune, the nation’s oldest black newspaper, Archie, Jr. was named one of "Philadelphia's Most Influential African Americans 2009: Movers and Shakers" for demonstrating leadership in the community. Archie serves on the boards of the Pennsylvania Intergovernmental Cooperation Authority, Universal Institute Charter School, Lincoln University (the first historically black university in the U.S.) and Universal Communities Homes, Inc.
Trial partner Teresa Cavenagh was awarded a Powerful and Influential Women award by the National Diversity Council at the 2010 Pennsylvania Diversity and Leadership Conference. At the conference, Cavenagh presented on a panel called Strategies for Professional Success. Cavenagh, who practices in the areas of commercial, class action, fraud, RICO and qui tam litigation, also presented earlier this year at the Pennsylvania Diversity Council Women in Leadership Symposium. In addition, she is a participant of the Leadership Program sponsored by the Committee on Women in the Profession of the Philadelphia Bar Association. Duane Morris' Boston office recently hosted the Asian-American Lawyers Association of Massachusetts' third annual Speed Mentoring Night. Twenty mentors and 42 mentees engaged in five rounds of 15-minute sessions during which law students, recent graduates and junior lawyers were paired with more-senior attorneys from various fields and affiliations. The event was featured in a spread in Massachusetts Lawyers Weekly. Duane Morris hosted and sponsored an event for the Chicago Committee on Minorities in Large Law Firms. "Sweet Home Chicago," is an annual cocktail and networking gathering of the Committee showcasing diversity in large law firms to attorneys and law school students from around the country. Partner Neville Bilimoria helped to organize and support the event and partner Cheryl Blackwell Bryson spoke on "Maximizing Your Chances for a Successful Summer Experience" along with a panel of outside presenters. The firm's Chicago office held a reception for more than 350 attendees after the program. Diversity and inclusion are key components of the firm's recruiting and retention programs. In fact, Duane Morris is the 2012 recipient of the George B. Vashon Innovator Award presented by the Minority Corporate Counsel Association (MCCA) for innovative best practices by a law firm in Recruitment and Retention. Duane Morris actively participates in diversity job fairs, including the MCCA/Vault Diversity Career Fair, the Philadelphia Area Minority Job Fair, the Southeastern Minority Job Fair and the Hispanic National Bar Association Annual Job Fair Program, for which it has been a major sponsor. The firm interviews at historically black law schools, including Howard University, Texas Southern University, Southern University and North Carolina Central University. Duane Morris uses women- and/or minority-owned executive search/recruiting firms in connection with lateral hires. Our efforts at improving recruitment of diverse attorneys were also noted by the Vault/MCCA Guide to Law Firm Diversity Programs, which singled out Duane Morris for being one of "only a handful of firms that engage minority- and/or women-owned search firms for lateral recruitment." Duane Morris is also a full participant in the Philadelphia Diversity Law Group (PDLG), a consortium of major area law firms and corporations. This means that Duane Morris will hire a 1L student who comes from a diverse background for a summer clerkship at Duane Morris. Duane Morris is a founding member of PDLG. Duane Morris counts among its permanent associates two diverse students from the PDLG program. In addition to the formal Duane Morris mentoring system, a requirement of all Diversity and Inclusion Committee members is to mentor one or two diverse associates in the firm. At Diversity and Inclusion Committee meetings, mentors provide feedback on how diverse associates are doing. The billable hours for each diverse associate are reviewed so that appropriate action can be taken. The goal of the committee is to be proactive and intervene whenever there is an associate who is experiencing difficulty for any reason. It is the policy of Duane Morris LLP that in acquiring goods and services we maintain an environment that promotes, increases and improves the quality of the overall participation of a widely diverse group of business enterprises. Duane Morris is committed to identifying diverse suppliers that can add value to our supply chain and provide an opportunity to increase our value to our clients. The Executive Committee of Duane Morris has assigned to the Chief Diversity Officer the responsibility for executive advocacy, support and oversight of the Supplier Diversity Initiative. The Chief Operating Officer of Duane Morris shall select a Supplier Diversity Leader to manage and oversee this initiative for Duane Morris. The Supplier Diversity Leader shall develop a Supplier Diversity Initiative that includes goals, strategies, monitoring and plan for implementation. The Supplier Diversity Leader and the Chief Diversity Officer shall jointly identify and establish annual supplier diversity goals. Either of them and/or their designee(s) shall represent Duane Morris externally with supplier diversity organizations and networks; serve as a recruiter for diverse suppliers and assist Duane Morris staff with achieving annual supplier diversity goals. The firm's approved Supplier Diversity policy has been posted on the firm intranet and on www.duanemorris.com. Definition – the Supplier Diversity Plan is the action plan which describes the sequence of steps through which vendor information passes from the time a new vendor is created until a decision is reached as to inclusion or exclusion in the diverse vendor data base. The firm is tracking and documenting Tier I (Direct Spend) Purchases from certified vendors meeting the criteria listed in 3. Components. Purpose – the Plan will serve as a guide that defines the Firm's Supplier Diversity goals and steps necessary to achieve those goals. It is a dynamic tool and will be revised and expanded periodically. Further information about each category is listed on the Supplier Classification Form, which is provided to new vendors for the purpose of collecting diverse information. Any firm that completes and signs the Classification Form (or provides their own form) will be listed as Diverse in subsequent purchasing reports. Implementation – Upon notice of creation of a new vendor, the Supplier Diversity Leader will send an Introductory Letter, blank Classification Form and business reply envelope to the vendor address listed with the account. The Supplier Diversity Leader will compile the results of returned, completed Classification Forms and add relevant information to the vendor's profile. In the event that Classification Forms are not returned within three weeks, a reminder will be sent. Goals – the goals of the program, in terms of recognized Diverse Suppliers as a percentage of the total dollars spent for goods and services, will be determined and revised by the Supplier Diversity Committee. Our goal in 2011 is a diverse spend of Tier I (direct purchases) that exceeds 8.48%. Reporting – reports will be provided upon request by the Supplier Diversity Leader for any time periods required, i.e. year to year, quarter by quarter, year to date, etc. These reports contain graphs which detail the percentage of diverse spending by categories, diverse spending as a percentage of the whole and by categories within the Minority-Owned umbrella. See below. Training – the Supplier Diversity Leader will offer training upon request to attorneys and staff that express an interest in assisting with the Supplier Diversity Program. Oversight – Oversight for the Supplier Diversity Plan is the responsibility of the Supplier Diversity Leader, reporting to the Director of Office Services, the Chief Operating Officer and the Chief Diversity Officer. Promotion – A plan for promoting the Supplier Diversity Program internally and externally will be developed by the Supplier Diversity Committee. Looking forward – The Purchasing Department currently collects Tier II Supplier Diversity data. A program to expand this program to other administrative departments will be pursued.